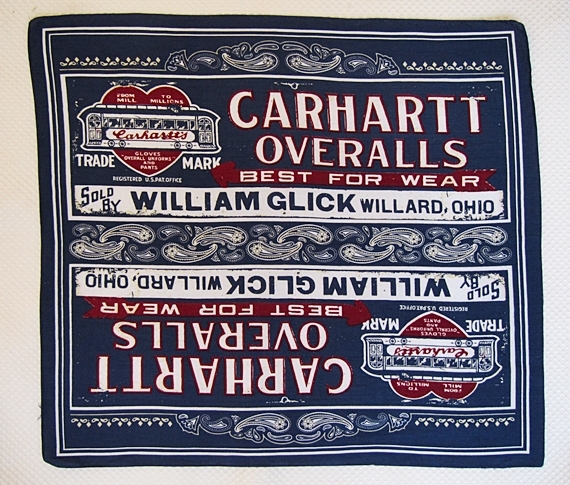 Fantastic CARHARTT OVERALLS advertising bandana likely dating to the 1930's possibly earlier. 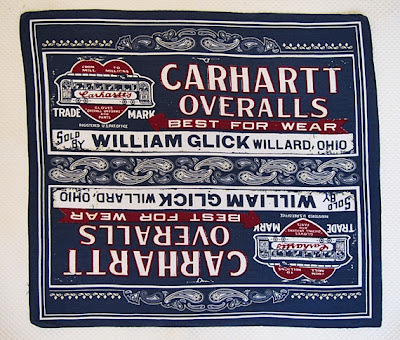 Mega rare joint effort featuring both the manufacturer (Carhartt) and retail store (William Glick of Willard, Ohio). Some of the nicest graphics and color combination seen on a promotional workwear bandana, fitting of one of the best brands ever. This bandanna even has the prerequisite paisley pattern. Like the use of the arrow directing BEST FOR WEAR to the heart mark trolly car logo. The seller of this rare piece must have hit the floor as it topped the $1,000 mark.